The start of the year for many of us is the time for a New Year’s resolution or two, and to perhaps embark on a new challenge. 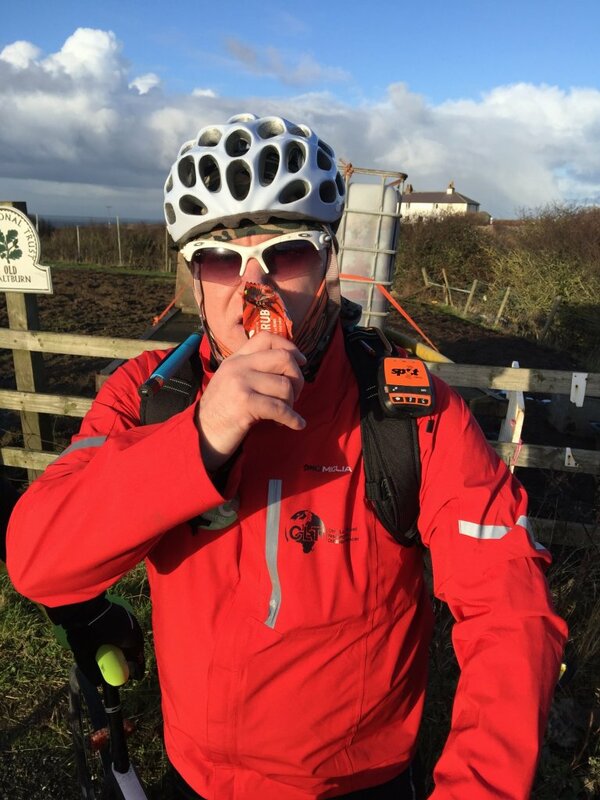 Spare a thought then for Paul Suggitt, who from today (1st Jan 2017) will be completing a huge (REALLY huge) challenge of his own creation… the Walk Run Ride Challenge. Over the course of the year he will be travelling 10,000 miles by either walking, running, or cycling. That’s about a marathon a day, every day, for a whole year. At Grub HQ we like to go on a run or few, or set ourselves a nice challenge, but none of us have ever attempted something that will require so much grit, determination, and ‘never say die’ attitude (apart from trying to sell insects to the masses, of course). We’re very proud to be supplying Paul with our Eat Grub bars to help give him the energy he needs to keep going, and will be keeping track of him over the course of the year. We caught up with him to find out more about his training regime, and why he’s putting himself through such a tough time. Hi Paul, can you tell us a little bit about yourself, and why you’ve created such a huge challenge for yourself? I am a web and app developer and an adventure athlete from the North East of England who helps raise awareness of great causes, and on the first of January 2017 I am taking on an epic challenge of completing 10,000 miles in 365 days by walking, running and riding a bike to help bring awareness of the Chris Lucas Trust. The distance I am doing is equivalent to completing a marathon distance a day, EVERY day for a year. This is the first big challenge I have done to date, having done lots of small fundraising events in the past, but none on this scale. Can you tell us your involvement with the Chris Lucas Trust, the fantastic charity who you’re doing this all for? I have raised money for a couple of years for the Chris Lucas Trust. The trust works so hard to help offer hope to children and young adults with a very aggressive form of cancer known as Rhabdomyosarcoma. A diagnosis of rhabdomyosarcoma is a truly devastating one as there are currently no effective targeted treatments for the aggressive form of this disease. Do you have a special pre-match process to get in the right mindset? The first thing I do is plan ahead. By doing this I know my daily training and mileage goals are set. I have found far better success at keeping to my training by doing this, as opposed to planning something last minute. The second thing I do when I agree on an event is I make it public. That way I have to complete it. It is a way of tying in my commitment from the outset as I know then that people are watching my outcome. This in turn turns on the training switch in my head and makes it less likely that I skip training sessions I have planned. Third thing is I warm up my muscles. Over time and given the fact I can sometimes do in excess of a marathon distance mileage, I have found my comfort warm up mileage. Once this is achieved I am able to sit “in the cruise” both running and cycling. I find this initial warm up mileage is often reduced if I warm up before an event or training session. This could be a pedal on the cycling turbo trainer for a few miles / 20 minutes before a cycling event or a run. What do you look for in an energy bar? I look for a bar that has a decent amount of protein contained in it in proportion to the carbs, and balanced with the right calories for my aim of leaning myself up and supporting what I burn. Can you tell us about the toughest training experience you’ve had so far? And what’s the furthest distance you’ll train before starting? My toughest training experience had to be the 45-mile ultra run I did from Hartlepool Marina to Whitby in October. This beat the Coast-to-Coast cycle ride in half a day that I did in August as a test of my endurance. It was hard going. What’s your best piece of advice for when the going gets tough? The best advice I can give is to try to remain focussed and keep thinking to yourself that every step or pedal gets you closer to your goal. Keep going and DON’T quit. Doing something like this attracts a bit of publicity. Where can people track you so that they can keep up with your exploits? On my training events and throughout the challenge itself, people can track me live as I wear a satellite tracker, allowing people to stay up to date with my progress from the comfort of their own homes. Events are posted on the Facebook and Twitter pages, along with the links to be able to track me live. (ed: See the bottom of the article for full links and where to follow Paul). Taste: Prior to tasting these bars, had anyone suggested insects as a source of protein, I would have looked rather dubious at them. These bars are not only super tasty; they are filling and allow the flavour to remain on the palette for some time after eating the bar. I could not taste any insects at all. Energy: These bars provided me with a great energy boost both in between workouts, and on long training days where I am often running or cycling for hours at a time. ed. Why not have a try of our energy bars made with cricket powder and see for yourself. Have you thought of what the next challenge might be afterwards? I have already been planning “What’s next in 2018” and can say it’s ambitious and international so watch this space. I hope to have Eat Grub bars fuelling this challenge as well.